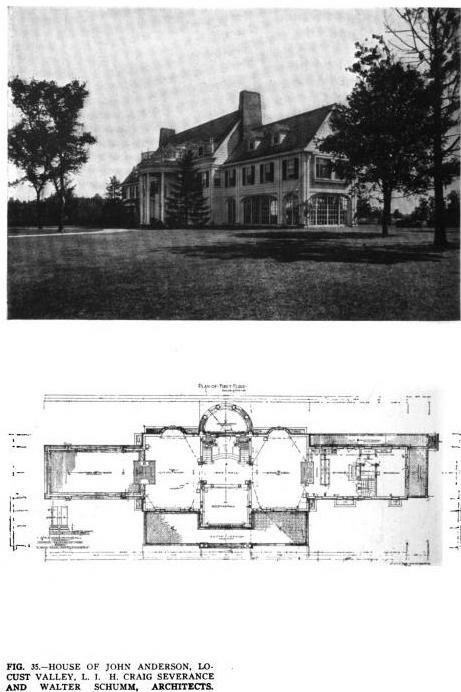 'Aberfeldy', the John Anderson estate designed by Severance & Schumm c. 1909 in Lattingtown. Click HERE to see 'Aberfeldy' on google earth. From Architectural Record, 1917. From the Bird's eye photos on Bing.com, the home does appear to still be standing at 181 Skunks Misery Rd -- love that name! If my memory serves me, you can't see the house from the road, but the outbuildings are visible. They are lovely Colonial Revival structures too, with details similar to the main residence, though I believe the property has been subdivided and they are separate homes today.